Guest writer Tal Gregory blogs about fly fishing (here) and books (here) between bouts of working, both at his job, and, on an old house that will never actually be finished. 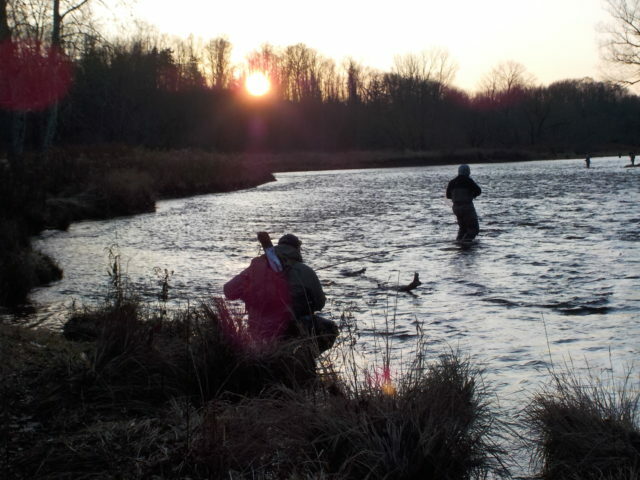 Fly fishing successfully for steelhead requires a broad range of skills. I have been working on acquiring them over the course of 20 years, in a series of widely spaced but furious two-to-five day immersions in this specialized part of the great, obsessive calling of fly fishing. I have fished out west several times, at the Trinity River in California and at the Bogachiel River in Washington State, but, mostly (we are in the Northeast here, after all) at the Salmon River in New York State. I try to make two trips a year, one in the fall and one in the spring. My career of fishing for steelhead has followed the usual learning curve. I spent my first few trips fueled by a vague dream of big fish, reinforced by one or two encounters with an electric tug that lasted about three seconds and which surprised and inspired the living heck out of me. There was the guided trip that, while it didn’t make the fishing seem easy, did make me realize both that the fish could be caught and that there was a huge amount to learn–and, more than one way to throw and sink a fly. I don’t know if you have ever fished a running line rig, but, it shares several attributes with bait fishing that do not usually appeal to someone using a fly rod: You use the tip of the rod to chuck a bunch of weight that pulls the line after it, and you catch more fish. 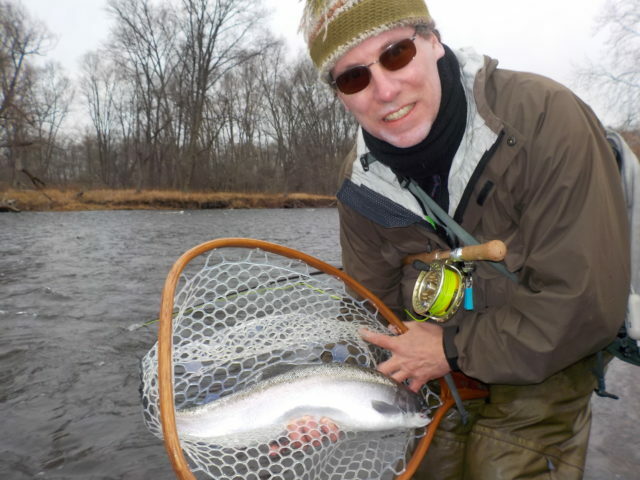 It is less “fly fishing” than “fishing with a fly rod,” but, it did put me into some winter steelhead one very cold St. Patrick’s Day in Altmar, NY. In the years since then, I have learned to fish with an indicator, to swing flies, and even to spey cast, although, I use an 11’3″ Redington Dually switch rod. I have caught fish using all three methods. Through a combination of reading everything I can find, learning the river by trial-and-error, and finding some friends who know more than I do, I have managed to up my game to the point where my most recent trip yielded back-to-back multiple-fish days. Do I know everything I need to know about catching steelhead on a fly at the Salmon River? You know the answer to that as well as I do. My latest lesson: Sometimes it pays to take your indicator off and blind-fish through a hole. This is a technique I have read about, and one I have used fishing for trout in smaller waters. Often, this is done like high sticking: fishing heavily weighted nymphs in fast water close to where you are standing, so you have almost no line outside the rod tip. In this case, I mean fishing your indicator rig at a distance, but without the indicator. I stumbled on this method with happy results this fall at the Salmon. Here’s how it happened. We were fishing in the DSR (Douglaston Salmon Run, a pay-to-play area in the lower section of the river), standing at the shallow side of the river and fishing a slot up against a cut bank. There was a sweet spot above a leaning tree, and, then, below the tree, a small back eddy with a very enticing foam line leading 10 feet down the river. BUT, the foam line began right at the base of the leaning tree, making this a very small and difficult window to get your fly into. I was the only one in our party who could fish the top of this run at all, and then only because we were fishing from river left and being left-handed, I could avoid the overhanging branch. (Did I mention the overhanging branch? If you’ve fished the Salmon, you probably already knew it was there). This branch was decorated like a Christmas tree with very small, salmon-egg colored balls. I had taken two fish out of the tail of this seam by getting a couple of lucky casts to stay up against the bank on good drifts, so I knew there were fish there. But I suspected the prime part of the lie was at the top, just below the overhanging tree. Eventually, it happened. I got too confident, or tried to overreach, and hung my rig in the tree, losing it all the way back to my indicator. It was my last Thingamabobber, and without any floatant for my back-up indicators, I decided that rather than wade (the approach to this hole is thigh deep in faster-than-quite-comfortable water) back out and bum one off my friends, I would just tie on a leader and try a few drifts without an indicator. And, it made a big difference: I could get my fly up into the top of the seam. My mend didn’t pull it all the way out of the lane. I felt like I was fishing my fly sooner rather than waiting for the slack between the indicator and fly to straighten. On my third cast, I nailed a nice, silver-as-they-come steelie right where I knew she should be, three feet below the top of the foam, right below that tree. It is not often that a new strategy yields such instant results. But, it is always a good thing to remember to fiddle with your tackle if you are not having luck (leader length, weight adjustments, fly size or color). These can all make a difference in how your fly is fishing and what the reaction will be. This is especially good to remember if you know you are fishing over holding fish but are having no luck. I tried again the next day, which was one of those bright, cold, late-fall days where the fishing seems to shut up like an off-season hot dog stand. Eventually, we found a little action, whether it was using stone flies, or the sun coming out, or some other invisible signal the fish could see but we could not. Fishing a fast, deep run, we managed to hook a few fish. To experiment with my new method, I had removed my indicator again. This was another situation where there was a far slot that the fish seemed to have been pushed over to, and the lack of an indicator helped me sink my fly and keep it farther out toward the bank. I hooked three, and, my friend, who was rotating through the spot with me, hooked two with his indicator rig. As empirical evidence, this is about as useful as a poll of two people who happen to be married about who does more chores around the house. But, I did come away with the knowledge that my experience the day before was not a fluke. Another arrow for my quiver of tricks to bring when hunting that most silver of aquatic questing beasts, Oncorhynchus mykiss, the steelhead rainbow trout. I have a lot to learn about direct line, or Euro-style nymphing. I was not using any kind of sighter line, but fishing by feel. Also, I was fishing farther out than most tightline nymphing instructions say you should, and yet, I had good success. It is time to do more research and experimentation, but I am confident that this new technique will yield more good results. Having success is the best way to create confidence in fishing, which is one of the top three ingredients in claiming steelheading rewards. It helps to keep your cast low if you are trying to get under branches, as the line does not hinge as much, and the lack of indicator means less wind resistance. It helps to keep your fly farther out toward the opposite bank on your first mend, as there is no indicator to pull the rig back out of the slot. It gives the fly a better ability to penetrate the water. It allows the fly to move more naturally, or at least differently, as it is not hung from above, but followed from the side by your line. You may not be able to detect subtle takes, where a fish takes and then quickly rejects your fly (in defense, with an indicator, you might not have been able to set quickly enough to get these fish anyway). It is more difficult to calibrate weight needed with this system, though I am hoping that with more experience, I will get better at this. I suspect that you do not have as much ability to mend without moving the fly unnaturally in the water, as the indicator will often act as a hinge and take a lot of the movement out of a later-in-the-drift mend. I always remember a fishless day at the upper fly-only zone of the Salmon River. There were not many folks fishing, and very few were catching anything. 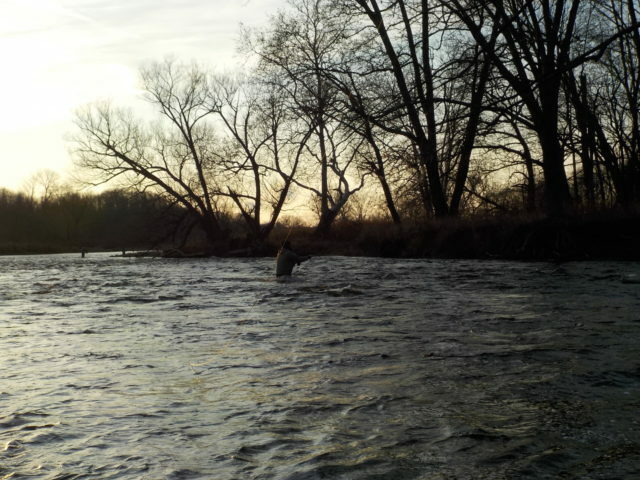 We were fishing below a steep and fast throat of a pool, choosing to fish where the river widened and slowed a little. Halfway through the morning, someone came walking down the river, staring into the faster water above us as it deflected off the far bank. When he started fishing there, I though he was an idiot. That was before he caught two fish, one right after the other, out of water I would not have looked at twice. He was using almost no line, and keeping his rod tip high, with no indicator but a lot of weight. I suspect now that he was essentially Euronymphing. It always pays to keep your eyes open, and when you see people doing something unusual, don’t just assume they are an idiot. They easily may be, I’ll admit. But, the point is, keep an open mind as well. There is still plenty for all of us to learn. Nice article. I used to fish the Salmon River with a specialty Noodle/Fly Rod and it was effective. If I had had the Euro Nymphing setup it would be as effective with the only limitations being distance fished. Just wonder what Euro Nymph Rod could handle those chrome screamers? Great point. I am not aware of any 6-wt. Euro rods, and so, I’d love to hear from others who know more. Devin Olsen does a great two-part write up specifically on euro nymphing for steelhead.